Embassy Suites by Hilton has opened a new property in Montreal. 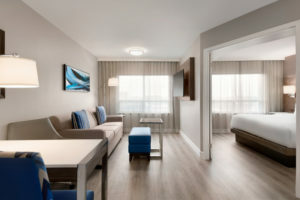 The 162-key Embassy Suites by Hilton Montreal Airport has a 1,260-square-foot meeting room, a 24-hour fitness centre, 24-hour convenience shop in the lobby, a 24-hour business centre, an on-site restaurant (West Side Social), and an in-house bar (OneBar). Owned and managed by Easton’s Group of Hotels, it is located less than 15 minutes away from Montreal-Pierre Elliott Trudeau International Airport. Guests staying at the property can enjoy a free made-to-order breakfast in the morning and complimentary drinks and appetizers daily at the Evening Receptions. All suites are equipped with microwaves, a mini fridge and a wet bar. Guests may upgrade for a higher floor, with faster WiFi and additional in-room amenities, including a bathrobe and a Keurig Coffee machine. Embassy Suites by Hilton Montreal Airport participates in the Hilton Honors® loyalty program.